With a Postcript coauthored by Michael W. GoheenIn print for two decades and translated into eight languages, Albert Wolters’s classic formulation of an integrated Christian worldview has been revised and expanded to reach new readers beyond the generation that has already benefited from this clear, concise proposal for transcending the false dichotomy between sacred and secular. 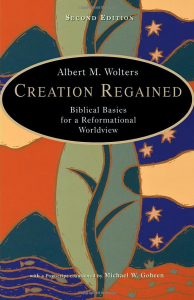 Wolters begins by defining the nature and scope of a worldview, distinguishing it from philosophy and theology. He then outlines a Reformed analysis of the three basic categories in human history — creation, fall, and redemption — arguing that while the fall reaches into every corner of the world, Christians are called to participate in Christ’s redemption of all creation. This Twentieth Anniversary edition features a new concluding chapter, coauthored with Michael Goheen, that helpfully places the discussion of worldview in a broader narrative and missional context.